As I may have mentioned in previous reviews, I love AEP SMGs with an unhealthy passion. There's just something about a tiny, metal gearbox equipped submachine gun that I just can't get enough of. JG has recently done a big push with their AEPs, releasing updated and new models and today we'll be looking at their newest version of the VZ61 Skorpion. This compact SMG uses the tried and true small TM type AEP gearbox which has limited, but existent aftermarket parts availability, allowing you to shape this guns performance to fit your needs. To find out more about this SMG platform, keep reading! I was sent this gun through Airsoft Atlanta, who has it available HERE, priced at $99.99. Airsoft Atlanta frequently carries aftermarket parts for AEPs as well as batteries and magazines, so it's a great place to pick up this gun as a package deal. 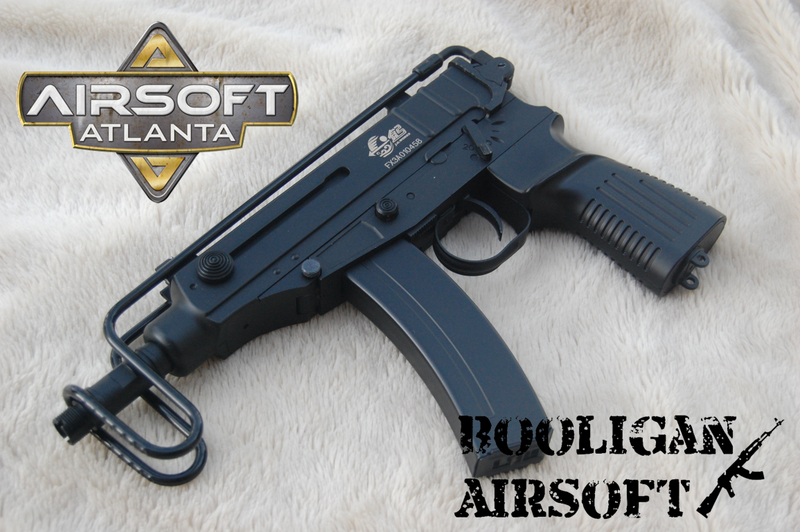 I want to take a minute to thank Airsoft Atlanta for their continued support of Airsoft Retreat and Booligan Airsoft's review programs! The JG Skorpion is a very compact SMG platform which is equipped with a metal lower receiver, metal folding stock, and polymer upper receiver and pistol grip. It's an ugly little gun, but I personally love the utilitarian design and somewhat crude ergonomics. With the magazine mounted in front of the grip, the AEP battery is stored in the pistol grip. The gun is extremely solid with zero creaks or wobbles to be found. JG did a good job replicating TM's packaging including the foam inner liner with cutouts for the individual accessories that come with the gun. Be sure to open up the small box inside, as it houses a few special accessories including the metal threaded outer barrel. I was surprised at how sturdy this little thing felt in my hands and how realistic it looked with the gorgeous matte black finish. Along with the Skorpion itself, JG includes a green type 7.2v AEP battery, trickle charger, removable front rail, metal threaded barrel, a few hex wrenches, and a thorough manual. The battery is a standard large AEP sized unit (referred to as a "Green type" normally), and spares are readily available. The JG Skorpion isn't a full metal replica, as the upper receiver is made of a polymer material, however, the way it is put together makes it extremely solid. The thing really is built like a tiny little tank, free from any creaks or wobbles. The only part that has any free play is the stock when it is unfolded, due to the way that it locks in place. The paint finish is matte black and seems to be quite sturdy, as it hasn't scratched or shown any real signs of wear yet. The Skorpion comes with a top folding metal wire stock that locks very solidly in the folded position using the front sight as a locking point. When unfolded, there is a bit of free play and it is hard to get a good sight picture due to the stock design. To fold it, you just squeeze the wires at the base and fold it onto the front sight. The pistol grip is made of plastic and acts as the battery compartment. To access the compartment, rotate the circular device at the bottom of the grip to unlock the hatch. You can then insert the battery or change the fuse if it blows. Reinstallation just requires you to push it firmly to lock it in place. The receiver is a very solid backbone for the gun with a metal lower and a polymer upper section. The controls are located on the left side consisting of a selector switch in a unique full auto-safe-semi layout over a 90 degree sweep, and a magazine release button. Pulling back the charging handles opens the faux chamber located on top of the receiver giving you access to the hop-up adjustment dial. At the front of the receiver, you can install the included lower RIS section for mounting accessories. From the factory, an orange plastic barrel is installed, however, you can install the included metal threaded barrel fairly easily. The only issue is that the plastic barrel is securely glued in place and will likely break like mine has when you try to remove it. That being said, the metal threaded barrel doesn't look bad, so it'll stay in place permanently on mine. The iron sights aren't great for long range accuracy, but this gun doesn't shoot accurately at long ranges anyway, so it's not a huge deal for me. The rear can be flipped to one of two range settings, and the front can be rotated like an AK front sight for elevation and even windage, due to the offset post. There are no real steel trademarks, licensed or not, however there is a JG marking on the left side of the upper receiver. There is also a serial number which appears to be unique to each gun. The included magazine is a hi-cap which holds about 80 rounds. This magazine is the single biggest handicap of the gun, as it doesn't feed very well at all, at least in my testing. I tried out a TM Skorpion low cap (58 rounds) unit, and it fits and feeds perfectly. I'd recommend searching out some Well or TM lowcaps for the most reliable feeding, as this magazine requires the occasional tap on the side to keep feeding. The rate of fire is the same as the JG MAC-10 I reviewed previously, coming in at a low 10 RPS with the stock battery. The battery space in this one is a little tighter than on some other AEP SMGs, but there's still enough space in the pistol grip to fit a small LiPo after custom wiring it up. Range and accuracy weren't bad at all for something with this short of a barrel firing at this low of a velocity. I was able to get shots out to 115' consistently on my standard torso sized target, which is longer than most pistols that I've tested, but lower than nearly every small AEG in my collection. This one isn't as quiet as the MAC-10, but it's still quieter than most other AEGs and gas guns out there. It's certainly an option for stealthy operations. Accessing the internals of this little gun is quite easy, only requiring you to remove the main body pin to separate the two halves of the receiver and take out a single phillips head screw inside near the hop-up. The main pin is secured with a hex screw, so be sure to loosen it before trying to remove the pin. Note that the selector switch just pops out when you remove the gearbox, so be sure not to lose it. Again, as with the TM MAC-10, the gearbox uses a funky little Torx screw that I don't have the proper wrench for, so I won't be able to open it up fully yet. It does use small nylon bushings, however, you're obviously not going to be throwing a really high strength spring in this thing, so they should get the job done. The hop-up is a plastic one piece unit with a rotary style adjustment dial. The inner barrel is brass and is about 126mm long. My hop-up was extremely greasy, so I disassembled it fully and cleaned it up thoroughly. One modification I'd really recommend isn't really a modification at all. Honestly, I'd plan on picking up spare lowcap magazines as this stock magazine just doesn't work very well at all. Other than that, the included threaded barrel and rail section allow you to mount up barrel devices or accessories like lights, lasers, or foregrips if you so desire. The Skorpion checks two of my favorite boxes in airsoft: 1. AEP SMG platforms and 2. Funky Eastern European weaponry. Performance wise, the gun's not great. It has a low ROF, low velocity, short range, and the stock magazine doesn't work very well. That being said, if you modify this for a LiPo pack and use low-cap magazines, this thing can be an absolute nightmare in CQB scenarios. Don't get this expecting it to be a sniper rifle, it's a tiny little SMG, and it shoots like one. It even fits in many large holsters allowing you to run it as a secondary if you're going with an Eastern European loadout. Overall, it's an imperfect SMG, but with a few small tweaks, it can really do a great job on the CQB field. Hey there, I got one of these little things while ago to use as a secondary weapon, in order to back up my shotgun. I did some extensive "testing" (read: playing around in the basement) before I took it to its first game, and when I finally took it out to play, I literally lost the battery as soon as I got on the field. Yeah. Anyway, I hopped over to Evike.com and checked out on a new 7.2v 500 MaH battery (As well as a few badass patches) and eagerly awaited its arrival. It's here now, and having charged the thing for about two and half hours with the trickle charger I originally got with the gun, I slotted it in, noting the fit being tighter than I remembered it. (Don't make the obvious joke.) I eagerly cranked the selector switch to full auto, and pulled the trigger. Confused, I switched to semi-aut. Nothing. I resumed charging for a bit and tried cramming the damnable battery into the compartment every which way it could go, without success. The point of this rambling pseudo-question is that I really don't feel like buying a new battery, or even warrantying the one I have. Any answers, ideas, advice? By the way, I love your videos. You made me want a grenade pistol, but of course, I'm way too cheap for that. Hey Booligan! I recently got the same AEP and I got feeding problems when I fired it. However, those problems were instantly solved after winding the Hi-Cap magazine, so maybe you can try that and see if it works?